Not too long ago we released a new version of the vRealize Integration Package for OnCommand WFA v3.0, which had a significant number of improvements around speed, flexibility, and overall robustness. The vRealize Integration Package is a series of vRO workflows which take advantage of Workflow Automation’s REST interface for executing workflows. Version 3 of the package has been almost completely rewritten to be faster and easier to use than previously. This was done by implementing functionality using scriptable tasks, storing the WFA REST host connection and referencing it, and improving the debug log output. New with this version is the vRealize Orchestrator action getUserInputValues. This action relies on functionality found in WFA version 3.0+ where the REST API has the ability to return valid values for WFA inputs which are “query” fields. 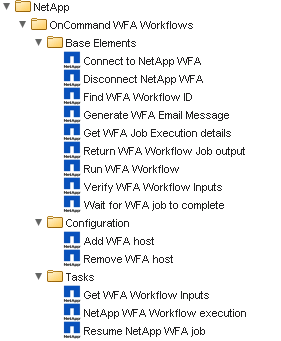 This action makes it easy to add dynamic, real-time population of workflow inputs based on the actual WFA data. Update (2016-02-01) – The package is now available on the NetApp Toolchest! This is the best location to get it from as it will always be up-to-date.